Ötzi the Iceman — our favourite Copper Age corpsicle — is the gift that keeps on giving. A recent analysis of the metal found in the Neolithic hunter’s copper axe suggests a point of origin in Southern Tuscany, which is far from where Ötzi’s frozen body was found. This suggests a long-distance trade route might have existed between central Italy and the Alps some 5,300 years ago. Ötzi’s frozen remains were found sticking out of a glacier high in the Italian Alps in 1991. By analysing his mummified body, scientists have learned much about this ancient European, and by inference, his Neolithic contemporaries. 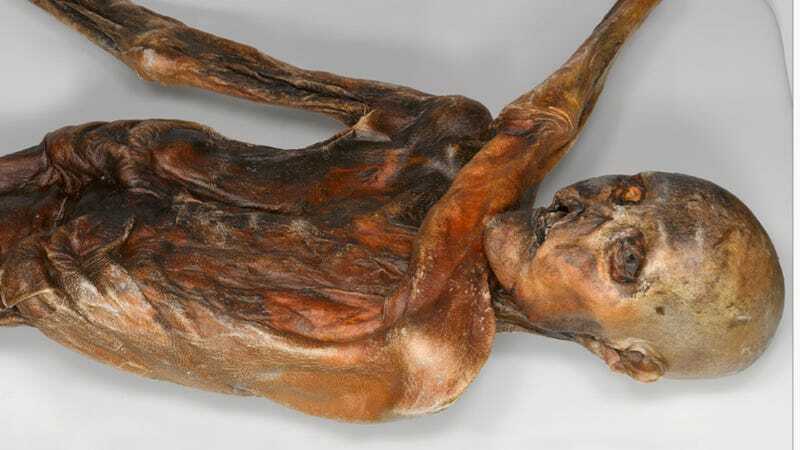 We know, for example, that Ötzi was between 40 and 50 years old when he died, and that he was killed by an arrow which struck his left shoulder. He suffered from chronic joint pain, Lyme disease, periodontal disease, and ulcers. His body, in addition to being covered in tattoos, is peppered with numerous non-fatal wounds, including knife cuts and a serious blow to his face inflicted during the final days or hours of his life. On a more positive note, Ötzi had access to an ancient form of prosciutto. Life was obviously tough for these ancient Europeans — at least for Ötzi. What’s particularly strange about this finding is that copper was being mined in the Alps during this time, so it’s a mystery as to why his blade should have come from so far. According to the University of Padova scientists who conducted the study, the metal was likely delivered to the area via a long-distance trade route, which if true, shows just how sophisticated Copper Age European culture was over 5,000 years ago. 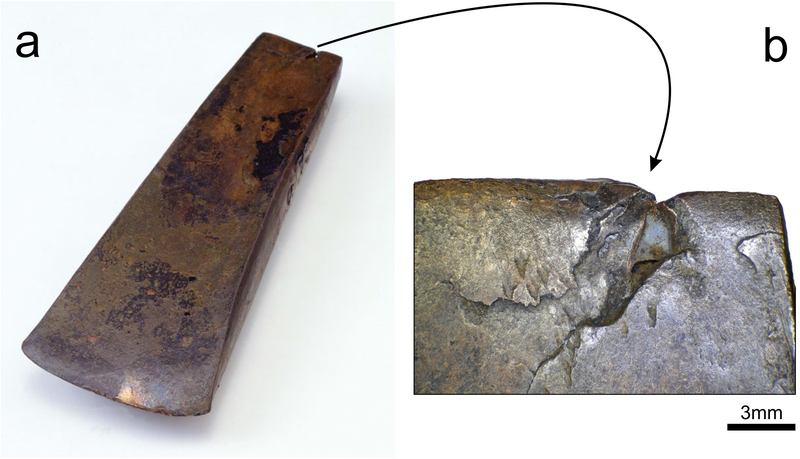 To pinpoint the origin of Ötzi’s metal, archaeologist Gilberto Artioli and his colleagues measured the lead isotope ratios of the copper blade. “The results unambiguously indicate that the source of the metal is the ore-rich area of Southern Tuscany, despite ample evidence that Alpine copper ore sources were known and exploited at the time,” write the researchers in their study. What the researchers don’t know, however, is whether the copper was delivered or traded as a raw ingot (which was then forged into an axe blade), or if the axe was shipped as a completed product. Also, because the scientists are working with a sample of one, i.e. Ötzi the Iceman, it’s difficult to know how he himself came to acquire the axe. It’s quite possible that he purchased it from merchants along a trade route, as per the researchers. But it’s also possible that he found it lying on the ground, or he inherited it from someone. Perhaps Ötzi was a journeyman, a person capable of traversing vast distances by himself, or maybe he was a thief, and he acquired the axe by stealing it. The possibilities are vast, but the presence of a Copper Age trading route is far from outlandish. The discovery of active copper metallurgy in Central Italy during this period is meshing well with what archaeologists know about the various cultures who inhabited Italy at the time. An active trading route, extending north from Tuscany for hundreds of miles, may explain the spread of metals throughout the region during this era.